Wouldn't we all love to look this good in our mid 50s? As registered dietitian Brenda Davis shows us, it's definitely possible! Brenda is a leader by all definitions of the word. She led amazing work on diabetes intervention research projects in the Marshall Islands, is an internationally acclaimed speaker, and the co-author of nine books! Her work in the field of nutrition is beyond inspiring, and the impact she has on so many lives will soon be as vibrantly clear to you as it is to me. Allison Rivers Samson: You've been heavily involved in establishing and running the Diabetes Wellness Center in the Marshall Islands. How did that project come about? Brenda Davis: The project was the brainstorm of Canvasback Missions. Canvasback Missions is a unique non-profit, Seventh-day Adventist organization that has been providing free medical, dental, and eye care to the people of the Marshall Islands for over 25 years. Jamie and Jacque Spence, the founders of Canvasback, witnessed the unfolding of the diabetes epidemic in the Marshall Islands. They were determined to find a way to stop the devastation. After several years of trials and tribulations, they were awarded a research grant by the U.S. Department of Defense. Canvasback enlisted other key partners, such as the Marshall Islands Ministry of Health and Loma Linda University. ARS: Why did you choose the Marshall Islands? BD: The Marshall Islands is where Canvasback does their work. (The Marshall Islands are about 2,300 miles SW of Hawaii). I became involved because the physician they hired to be the medical director of the research project had recently purchased my book, Defeating Diabetes, at a conference where I was presenting. He suggested that they hire me to design and implement the diet portion of the intervention program. The Marshall Islands has the highest death rates from diabetes in the world. It is a tiny country, both in size and population. There are about 60,000 people. Half of them live in Majuro which has an area of 3.7 square miles, and another 15,000 live in Ebeye which has an area of only 0.14 square miles. The soil is poor and produce is very expensive. Most of the adults have either diabetes or prediabetes. Amputations due to diabetes are the most common surgeries on the island. ARS: Wow, that is heartbreaking. What are a few positive stories from your work in the Marshall Islands that you can share? BD: There are so many. When we arrived, people refused to walk anywhere for fear that others would assume that they were too poor to pay $0.25 for a taxi. Meals were essentially sticky white rice and fatty meat (often Spam) washed down with Luau (first ingredient is high fructose corn syrup). One of the most population snacks for children is dry ramen noodles with Koolaid powder sprinkled on top. People had no idea that diabetes was related to diet and lifestyle. Seventy years ago there was almost no diabetes in the Marshall Islands. People were slim, active, and lived off the land. They ate plants and fish. Most of the calories came from coconut and coconut products. During the first two weeks of each program, when the clinic provides 3 meals a day, the success is remarkable. Consistently, participants report dramatic reductions or complete disappearance of pain in the legs, arms, and joints. They no longer require massages at night to reduce leg pain so they can sleep. Walking becomes much easier. Many report significant reductions in nightly trips to the bathroom. Most notice tremendous changes in their bowel habits, with greater frequency and bulk of stools. Because fiber intake is so low (about 5-10 g/per), they often have bowel movements once or twice a week (sometimes even less). Eating 40-50 g of fiber in a day ensures daily bowel movements! Almost everyone reports increased energy. Weight loss averages about 5 lbs per person. Blood tests indicated impressive changes as well. Fasting blood sugars declines 50-75 mg/dl on average and 200-300 mg/dl for some individuals. Cholesterol and triglycerides also drop significantly, as does blood pressure. These changes are seen even with a dramatic reduction in medication use (or elimination of medication). Close to 90 percent of the participants in the research interventions stopped taking oral hypoglycemic agents, cholesterol, blood pressure, and other medications. After 12 weeks, average weight loss was approximately 10 pounds per person. Blood sugars were still down about 30 points from baseline, and HbA1C was down an average of 2 points. HbA1C is a blood test that measures control of blood sugar over a 3-month period. Optimal HbA1C is under 5%. HbA1C of 7 percent or more indicates poor blood sugar control and increased risk of complications due to diabetes. A 2 point drop in HbA1C is extraordinary. Every 1 percent the HbA1C drops, the risk of health complications drops by 30-40 percent. Changes seen after 12 weeks were more variable, with some participants making remarkable recoveries and others slowly regressing. The stories of committed participants are truly inspiring. One of our most skeptical subjects, a health care worker, brought her fasting sugar from 187 to 108 and her HbA1C from 8.7 to 5.7. Some of our newly diagnosed diabetics brought their blood sugars below the cut-off of 126 mg/dL and their HbA1C’s below the goal of under 6 percent without any medication. Several other participants saw drops in HbA1C’s of 3 points or more – from 9 or 10 percent to 6 or 7 percent. Although we had only a few participants on insulin, all of them had to discontinue its use. For many of our participants, these changes were nothing short of miraculous. In the Marshall Islands the view of diabetes has always been of a devastating disease with a very slippery slope. It is impossible to escape the experience of seeing family members, friends, and neighbors lose their vision, their limbs, and their lives. To witness recovery or healing from this dreaded disease was unheard of. I think this experience has given hope to many people in this country, and to people around the world. ARS: Your book The Raw Food Revolution Diet is a science-packed guide for health-conscious individuals interested in eating a high amount of raw foods. How did you choose to focus on raw foods? Do you have a favorite raw vegan dish or recipe? BD: My co-author, Vesanto Melina, and I were asked by our publisher to write the nutrition section of this book, which was both a cookbook (recipes by Cherie Soria, a fabulous chef instructor and owner of Living Light Culinary Institute). It was a wonderful opportunity to learn more about raw food diets. Afterwards, we decided to write Becoming Raw -- a book that provides solid scientific guidelines for people who prefer to eat a raw vegan diet. Our goal as dietitians is to help those who want to eat vegan to get it right -- whether they eat conventional diets, low-fat, raw, whole-foods or otherwise. When vegans do well, we send a strong message that human beings do not need to cause pain, suffering, and death to other creatures in order to thrive. I eat a high-raw diet, although it is not completely raw. I absolutely love raw meals, however, I often make a warm legume-based soup to accompany my meal, especially in the winter time. I have many favorite raw dishes, including nut cheeses and desserts. In our Raw Food Revolution Diet book, I love the pizza, burritos, and Vietnamese salad rolls. ARS: In 2000, you wrote the book, Becoming Vegan. Now, in 2014, you've got two new books with similar titles, Becoming Vegan: Express Edition and Becoming Vegan: Comprehensive Edition. Are these updates or revisions of the earlier book? What is the difference between the Express and the Comprehensive Editions? BD: Becoming Vegan: Express Edition (2013) and Becoming Vegan: Comprehensive Edition (2014) are similar in layout to the original 2000 edition of Becoming Vegan, however, the content is entirely new. We didn't use any of the writing from the original version. Some people have asked us if it is worth getting the new books if they already have the old one. The answer is a big YES! It is unbelievable how much things change in the nutrition world in a single year, let alone 13 or 14 years. If you want the most current information on vegan nutrition and health, these books are indispensable. 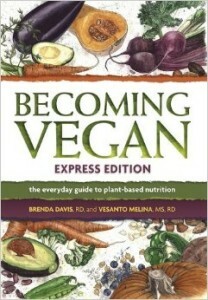 We did two versions of Becoming Vegan -- the Express Edition and the Comprehensive Edition. The Express Edition came out in 2013, and the Comprehensive Edition is hot off the press. Both books cover all the nutrition essentials -- macronutrients (protein, fat and carbohydrates), micronutrients (vitamins and minerals), clean eating, lifecycle nutrition (pregnancy, lactation, infancy, childhood, adolescence, seniors), weight issues (the Comprehensive Edition also includes eating disorders), sports nutrition, and a food guide. Both discuss diet and disease as well as the ethical and environmental implications of plant-based diets. The big difference between the two books is that the Express Edition is written for consumers and is 283 pages long, while the Comprehensive Edition is written for health professionals and others wanting more detail and full referencing -- it is 614 pages long. ARS: Impressive! I love how your articles, talks, and books are so grounded in scientific research. I commonly get questions about calcium and iron intake. What are a few vegan sources (and combinations) of these nutrients that you'd recommend? BD: Thank you so much Allison. As for calcium, everyone knows mammal milk is a rich source. In fact moose milk and deer milk contain about twice as much calcium per cup as cow's milk. This does not make them "essential foods" for humans. For people who prefer to avoid consuming the milk of other mammals, there are many excellent calcium sources. It is interesting to note that before humans used the milk of cows, goats, and other mammals, average calcium intakes were estimated at 1,500-2,000 mg per day -- mostly from green leafy plants. We can get calcium from similar sources. For adults, the calcium RDA ranges from 1,000-1,200 mg per day. To achieve this target, vegans need to include rich plant sources of calcium such as dark leafy greens that are low in oxalic acid (e.g. broccoli, kale, turnip greens, mustard greens, napa cabbage and Chinese greens), almonds, almond butter, tahini, blackstrap molasses, beans and figs. High oxalate greens such as spinach, beet greens, and Swiss chard are high in calcium, but the oxalates they contain bind the calcium making it unavailable for absorption. To further boost intakes calcium-fortified foods such as non-dairy beverages and calcium-set tofu can be included as well. These foods are extremely helpful as they often contain close to 300 mg calcium per serving. Many people will be surprised to learn that there is no greater risk for iron deficiency anemia among vegans than among the general population. Vegans actually consume more iron than omnivores. However, vegans do not consume the most bioavailable form of iron called heme iron. Heme iron is the iron in blood so comes only from animal flesh products. We are just beginning to understand that non-heme iron (found in plants and animal products) gives us an advantage over heme iron, keeping us on safe ground between too little and too much iron. Plant sources of iron are ideal, as the body has some control over absorption efficiency and can adjust uptake to suit our need. If our iron reserves are low, we absorb more iron from plant foods; if abundant, our intestines block the absorption of this non-heme iron. Pregnant women can absorb over 60 percent more iron than they did before pregnancy. Heme-iron often acts as a pro-oxidant, potentially increasing disease risk. ARS: Is it true that squeezing lemon juice onto greens makes the iron bioavailable because the vitamin C unlocks the iron? BD: Yes, any foods rich in vitamin C or organic acids such as citric acid increase the absorption of iron. (they change the form of iron so it is soluble and more absorbable). ARS: Along those same lines, what are the health benefits people see when transitioning to a vegan diet from a meat-centric diet? BD: Generally, but not always, body weight drops and blood cholesterol, triglycerides, and blood glucose levels fall; many people report having more energy. We have to be careful about generalizing though because there are good and not-so-good omnivorous diets and vegan diets. However, vegan diets are usually higher in fiber, phytochemicals, antioxidants, vitamin C, magnesium, and potassium. They also contain less saturated fat, less cholesterol and fewer environmental contaminants. On the down side, they can be low in vitamin B12, vitamin D, omega-3 fatty acids, and in some cases, iodine. Well-planned vegan diets have been shown to be highly beneficial. Studies comparing people with different dietary patterns (vegan, vegetarian, semi-vegetarian, and omnivore) have clearly shown advantages for vegans and vegetarians, including less heart disease, hypertension, cancer, diabetes, kidney disease, cataracts, and intestinal disorders. ARS: What do mainstream health professionals like dietitians and doctors think about vegan diets? Are your books accepted by health professionals? BD: Most health professionals not only accept that vegan diets can be nutritionally adequate, but they also recognize their potential in the prevention and treatment of chronic disease. 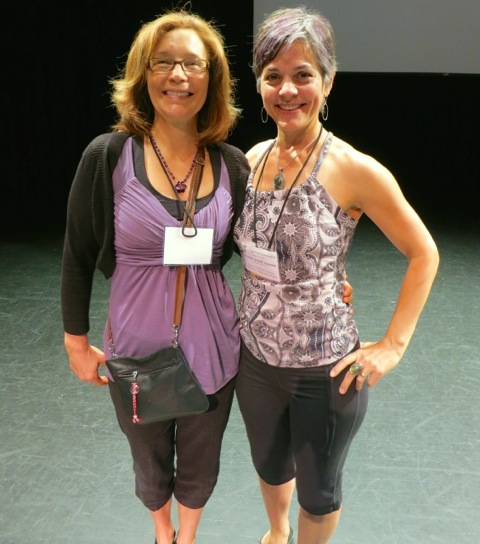 Vesanto and I have been invited to speak at dietetic and medical conferences throughout the U.S. and Canada, and internationally. Our books are used as textbooks in university and college nutrition courses, and are used as resources in many hospitals and wellness centers. This year, Becoming Vegan: Express Edition won the Canada Book Award, was a Book of the Year Award finalist, and received an honorable mention, and the American Library Association gave the book a star rating, recommending it is “the go-to book” on vegan nutrition. BD: I think that North Americans are becoming more health conscious (smoking less, exercising more, drinking less soda, eating more fruits and vegetables, and eating less red meat, etc). However, I am not so sure that this is translating into better overall health. It seems obesity and diabetes rates continue to rise, although cardiovascular disease rates have fallen. It may be that Americans are eating more calories, and more processed foods. As for what is prompting the shift, I think people are becoming more aware of the connection between diet, lifestyle and health -- the evidence continues to mount and research reports are all over the media and internet. People are trying to make better choices, but nutrition information is often conflicting and many consumers are left confused. ARS: Do you ever indulge in sweets (and if so, what's your favorite) or do you primarily adhere to only "healthies?" BD: My favorite sweet treats are raw desserts such as frozen fruit "ice cream", raw puddings (usually with figs, bananas, apples and cinnamon or other fruit), and raw chocolate treats such as brownies, raw turtles, stuffed dates, etc. I use dried fruits as my source of sugar in these goodies. For special occasions I make raw cheesecake or carrot cake or a baked fruit crisp. At Christmas time, I also make more traditional cookies (vegan versions, of course). Thank you, Brenda, for your always-inspiring insights and the fabulous work you are doing to help so many!